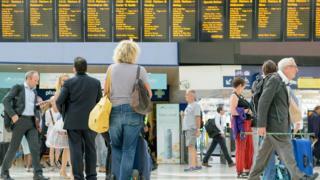 Rail passengers face "another difficult year" with more major timetable changes and engineering works, MPs warn. Government management must improve "considerably" ahead of the changes, a Public Accounts Committee report found. It said passengers suffered "significant financial and emotional costs" during problems last year and they risk "continuing to pay the price" for strategic failures. The government said a "root-and-branch" review of the railways was under way. But the PAC said the Department for Transport still had "a way to go" before Network Rail - which manages tracks and other infrastructure - and train operators work together in a way that minimises disruption during infrastructure projects. Last May, Network Rail attempted to roll out timetable changes which affected 46% of all services. The report found it caused "unprecedented disruption" for weeks across the south-east and north of England. Govia Thameslink Railway and Northern failed to run 780 scheduled services on average each day, the equivalent of one in 10 trains. Other services were "significantly delayed and overcrowded". At the time, passengers told the BBC how the problems affected them. One, Rebecca Pipe, from Rochdale, said her health was suffering, because travelling home from Manchester Victoria after treatment for breast cancer was "horrible and incredibly stressful". Another passenger, Karen Bregan, who suffers from back problems, said having to stand on trains every day into Manchester left her "really stressed and uncomfortable". The PAC report warns that even more timetable changes than last May are expected 12 months on, with "significant changes" also due in December. A report published by the regulator Office of Rail and Road (ORR) in September said "no-one took charge" during the timetable last year's travel chaos. It said track manager Network Rail, two train operators and the DfT "had all made mistakes". But ORR chair Prof Stephen Glaister told the BBC "it was unclear" who should have the responsibility for tackling the problems. DfT said last summer's disruption was "unacceptable" and the Glaister Report's initial findings had helped deliver timetable changes more successfully in December. "The independently-chaired root-and-branch review of our railway is considering all parts of the rail industry to ensure the focus is on putting passengers first.